Kara Woods, owner of Stage To Move, has been featured on FOX Television and in Money magazine. She was named the 2010/11 Professional Woman of the Year by the National Association of Professional Women for outstanding leadership and commitment in the staging and design profession. Kara was the International Top 100 Magazine's 2013 staging and design award recipient as well as the 2014 RESA'S United States Top 10 Real Estate Stager. Click here to read further. Home staging is the process of taking your home and making it into a product--a product that will sell faster and for more money. A staged home looks organized, stylish, and pulled together. Staging creates an atmosphere of neutrality and universal appeal in your home. Stagers position furniture to maximize a home's architectural attributes and showcase its best features. Staging creates a feeling in a room that makes a buyer want to enter. If a buyer can mentally "move in," he or she will be motivated to buy. Our goals at Stage To Move are the same as yours. We want to help you sell your home for the highest price as quickly as possible. Stage To Move is accredited and insured. 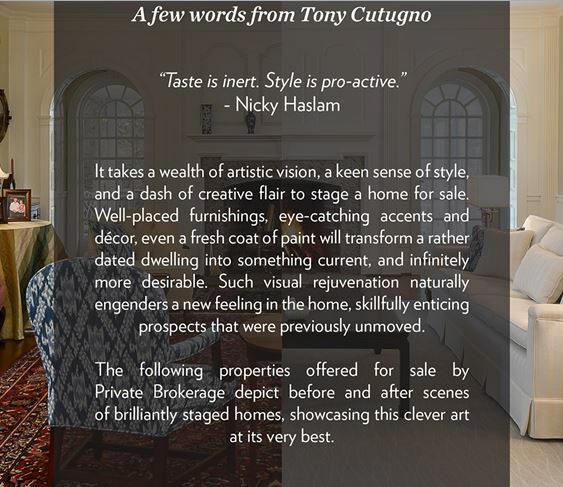 By combining objectivity with a trained eye, each of our designers can make your home irresistible to buyers! The services we provide allow a seller to choose the level to get involved. We can do as much or as little of the work as you (or your budget) would like. Stage to Move serves customers in Connecticut, New York, and the New England area, particularly in Westchester and Fairfield counties.